Chanteur Country US né Douglas Jackson Brooks, le 19 Juin 1956 à Newman (Georgie). Contemporary country star Doug Stone made his name as a lonesome baritone balladeer, though he's also adept at hard up-tempo country. 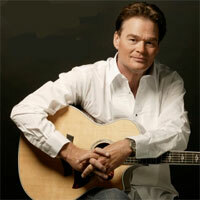 Stone was born and raised in Newnan, GA, and learned guitar from his mother — also a country singer — starting at age five. As a teenager, he performed in skating rinks in his hometown and later moved on to playing area bars while working long hours as a mechanic during the day. Stone was already several years past 30 when a Nashville-based manager saw his act and helped him finally land a record deal with Epic. His self-titled debut was released in 1990 and broke him in a big way with the despairing lead single "I'd Be Better Off (In a Pine Box)," which shot into the country Top Five. Stone landed three more Top Ten hits from the album, including "Fourteen Minutes Old," "These Lips Don't Know How to Say Goodbye," and his first number one, "In a Different Light." He quickly completed a follow-up album, I Thought It Was You, for release in 1991, which confirmed his downtrodden persona and became his second straight million-seller on the strength of three Top Five hits: the title track, "Come In Out of the Pain," and a second number one in "A Jukebox With a Country Song." Shortly before the release of his third album, From the Heart, in 1992, Stone underwent quadruple bypass surgery; he recovered in time to issue the holiday album The First Christmas by year's end. Meanwhile, From the Heart kept spinning off one hit after another: "Warning Labels" and "Made for Lovin' You" went Top Ten, and both "Too Busy Being in Love" and "Why Didn't I Think of That" topped the charts. Stone continued his frantic hitmaking pace with 1993's More Love, which contained three Top Ten smashes in "Addicted to a Dollar," "I Never Knew Love," and the title track. Like From the Heart, More Love went gold, and Stone followed it in 1995 with the compilation Greatest Hits, Vol. 1, whose newly recorded "Little Houses" went Top Ten. 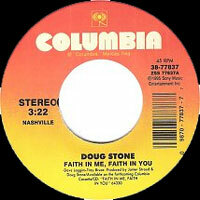 Later in the year, Stone returned with Faith in Me, Faith in You; while it featured hits in the title track and "Born in the Dark," nothing reached the Top Ten. To make matters worse, his health problems continued: in December 1995, he suffered a near-fatal heart attack, and the recuperation time put the recording of his next album on hold. In 1997, Stone was nearly killed in a plane crash, and all the near-death experiences led him to slow down his touring and recording pace. He eventually parted ways with Columbia and went to Atlantic for 1999's Make Up in Love, his most pop-oriented offering to date. Thanks to declining sales, it was his only album for the label, and he subsequently moved to the independent Audium label for 2002's The Long Way. Live at Billy Bob's Texas was released by Smith Music Group in 2009. 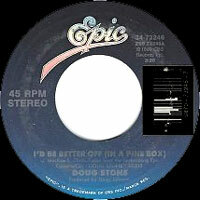 Over the next few years, Stone continued to act and tour; he also re-recorded his hits for a number of smaller labels. 02/1990 SP EPIC 34-73246 (US) . 06/1990 SP EPIC 34-73425 (US) . 10/1990 SP EPIC 34-73570 (US) . 02/1991 SP EPIC 34-73741 (US) . 06/1991 SP EPIC 34-73895 (US) . 10/1991 SP EPIC 34-74089 (US) . 02/1992 SP EPIC 34-74259 (US) . 06/1992 SP EPIC 34-74399 (US) . 10/1992 SP EPIC 34-74761 (US) . 02/1993 SP EPIC 34-74885 (US) . 06/1993 SP EPIC 34-77025 (US) . 10/1993 SP EPIC 34-77228 (US) . 02/1994 SP EPIC 34-77375 (US) . 06/1994 SP EPIC 34-77549 (US) . 10/1994 SP EPIC 34-77716 (US) . 02/1995 SP COLUMBIA 34-77837 (US) . 06/1995 SP COLUMBIA 34-77945 (US) . 09/1995 SP COLUMBIA 38-78039 (US) .